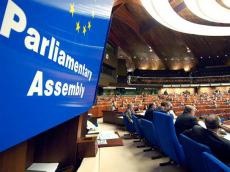 The autumn session of the Parliamentary Assembly of the Council of Europe (PACE) is starting its work in Strasbourg Oct. 8. Azerbaijani delegation headed by chairman of the parliamentary committee on international relations and inter-parliamentary ties, head of Azerbaijan’s permanent delegation to PACE Samad Seyidov will take part in the session that will last until October 12. The delegation also includes chairman of the Azerbaijani parliamentary committee on cultural affairs Rafael Huseynov, MPs Sevinj Fataliyeva, Sahiba Gafarova, Ganira Pashayeva, Ulviya Agayeva, Asim Mollazade, Chingiz Ganizade, Elshad Hasanov, Sabir Hajiyev, Fazil Mustafa and Nagif Hamzayev. During the session, the participants will hear a report of the Bureau and the Standing Committee of the Assembly on the work done, and the results of the observation of the parliamentary and presidential elections in Turkey held June 24 this year will be discussed. The participants will also discuss the procedures related to the PACE mandate and voting, unlimited access to PACE, UN member states, including “grey zones”, by Council of Europe and UN human rights monitoring bodies, as well as issues of nuclear safety, Islam in Europe, radicalization and Islamophobia, and other issues. The session participants will also hear a report by a member of the Azerbaijani delegation Sahiba Gafarova on the topic “Radicalization of Migrants and Diaspora Communities in Europe”, and an exchange of views will be held on this topic. MPs will also speak on issues on the agenda. Samad Seyidov told Trend that despite there are no issues directly related to Azerbaijan at the session, the Armenia-Azerbaijan Nagorno-Karabakh conflict, as well as issues related to refugees and IDPs will traditionally be on the agenda this time, too.